Neil’s internet talk show, American Truth Finders, will search for the facts of what is going on in America that is leading this country down the wrong path. In this quest to sort out the facts, there will be many theories. Some will be found to be truths, some non-truths. And there will always be the conspiracy theories. This show will investigate all those theories to give it’s listeners the knowledge to separate fact from fiction. Whatever the political position, Republican, Democrat, Libertarian, or other, if it’s not the truth it will be exposed. Neil Douglas has been a Talk Show host for over 15 years, exposing the truth of the politics that is destroying America. He has interviewed many individuals, who have carried the banner of truth of what is going on in this country. Some well known, others not , but all are the strongest Americans you will ever find. One of those patriotic Americans was Aaron Russo, producer of, The Rose with Bette Midler, Trading Places with Eddie Murphy and Dan Akroid. More importantly, Aaron Russo was a strong believer in America and the Constitution. He started the Constitution Party and asked Neil to head the Indiana division. As honored as he was,he had to decline the honer because of his broadcasting connections. Another patriotic American and a strong believer in the Constitution, Linda Thompson, an Indianapolis attorney, he also had the pleasure of interviewing. Unfortunately, both Aaron Russo and Linda Thompson died at relatively young ages. He also interviewed US Secretary of Commerce Ron Brown, when he was with the Clinton Administration. Shortly after, he was killed in an airplane crash. Speculation was, he had been shot in the back of the head. Truth or conspiracy theory, no one knows. 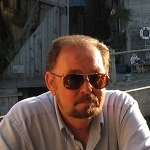 Federal whistle-blower and activist, Stew Webb, is another patriotic American Neil has interviewed. When attending a press conference with Bill Clinton, Neil asked about Nafta and when there would be an independent investigation of Waco. There was no response, other than a quick end to the press conference. Neil has also substituted for talk show hosts Tom Donahue, and Bo Gritz , who was one of the most decorated military heroes of our time.